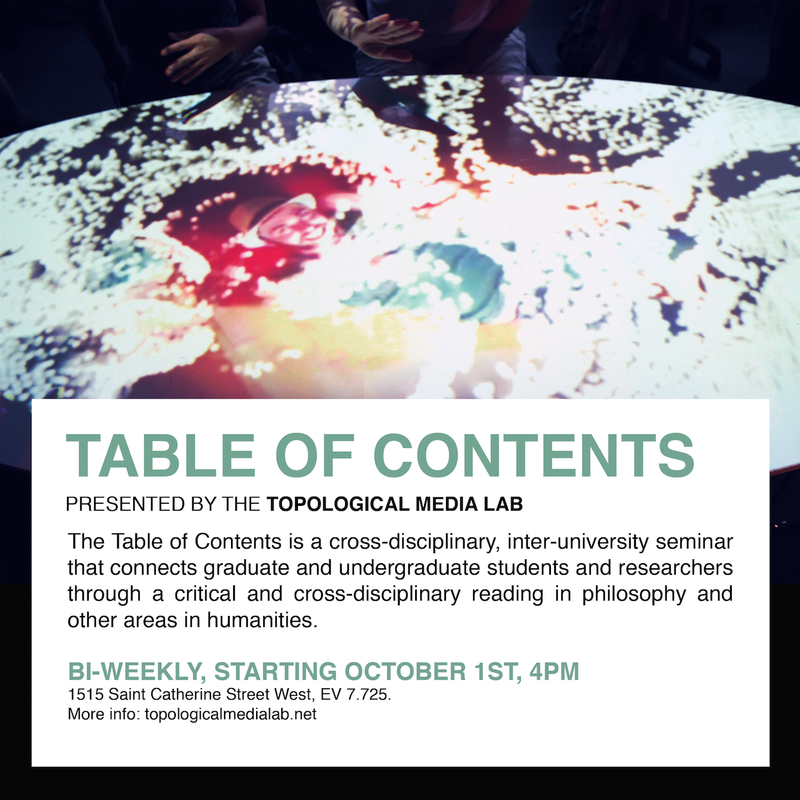 The Table of Content is a cross-disciplinary, inter-departmental, and inter-university seminar that connects graduate and undergraduate students and researchers through a critical and cross-disciplinary reading in philosophy and other areas in humanities. The texts will be discussed from angles that relate to the expertise and interests of those who are taking part in the seminar rather than a classical reading of literary texts, and will be choreographed and enriched by environmental and networked computational media ambiences that allow for embodied experiences of remote participants by using Topological Media Lab’s Table of Content platform as a communication and interaction portal. Please contact Omar Al Faleh at admin@topologicalmedialab.net if you have any questions. Merleau-Ponty, Maurice. “Space” in Phenomenology of Perception. Translated by Colin Smith. Paris: Routledge, 2013: 283-348. Merleau-Ponty, Maurice. “Space” in Phenomenology of Perception. Translated by Donald Landes. Oxon: Routledge, 2013: 253-311.